The 2015 GMC Yukon has been completely redesigned, featuring increased engine output and improved fuel economy, more standard features and improved options, an integrated fold-flat third-row seat, refreshed exterior styling, and a quieter interior. The muscular SUV comes standard with 18-inch alloy wheels, fog lamps, front and rear parking sensors, a locking rear differential, heated power-adjustable manual-folding mirrors, and automatic wipers. The GMC Yukon is among the most desirable full-size SUVs featuring towing capability. The rugged truck-based Yukon is built to do work, but with attention to attractive design and detail. A bold front fascia, dominant lines, and a square rear are sure to turn heads at every corner. The GMC Yukon SLE and SLT come standard with a 5.3-liter V8 engine that generates 355 hp and 383 lb-ft of torque. 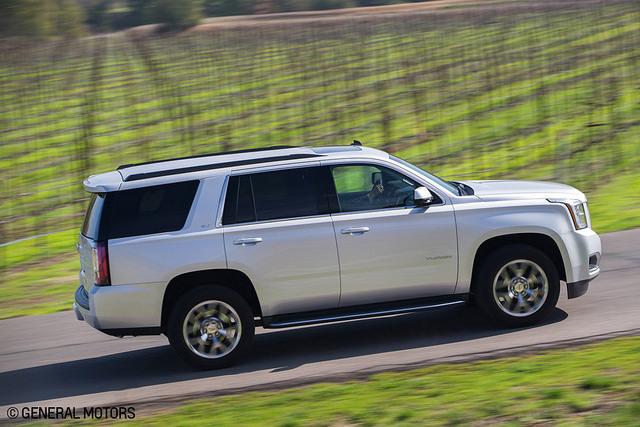 The top-of-the-line Denali is powered by a 6.2-liter V8 that produces 420 and 460 lb-ft of torque. A properly equipped 2WD Yukon SLE or SLT is rated to tow an impressive 8,500 pounds. A 2WD Yukon equipped with the 5.3-liter V8 earns 16 mpg city, 23 mpg highway, and 18 mpg combined fuel efficiency ratings. The 4WD Yukon gets the same ratings, but highway fuel efficiency dips to 22 mpg highway. These numbers are respectable for a full-size SUV. The newly designed interior boasts an attractive design, spacious and comfortable seating, and high-quality materials. The intuitive infotainment system has a large, easy to read display, while the gauge cluster’s graphics are easily interpreted and easy to read in any light. For the first time, the Yukon’s third row seat can fold into the floor instead of having to be removed for extra cargo space. Power-actuated second- and third-row seating is a new option allowing users to easily stow and adjust seats with ease. Maximum cargo capacity reaches 94.7 cubic feet when the second and third rows are folded down. 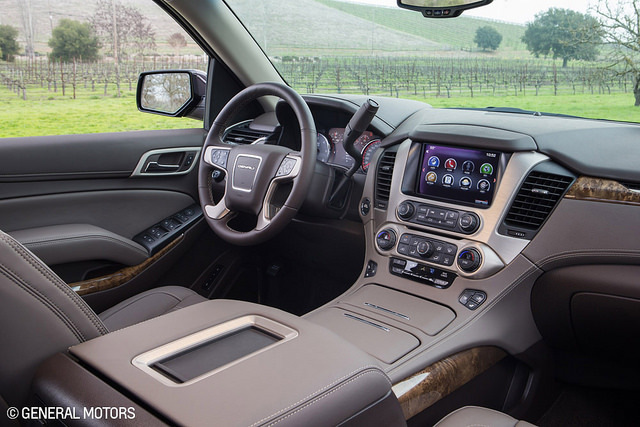 The 2015 GMC Yukon is packed full of standard technology for the safest possible driving experience. The long list of safety features include; antilock disc brakes, traction control, stability control, front-seat side airbags, full-length side curtain airbags, OnStar, front and rear parking sensors, and a rearview camera. A head-up display for the driver, forward collision alert, lane-departure warning, a vibrating safety alert seat, a center airbag between the driver and passenger, rear cross-traffic alert and blind-spot monitoring are either available or standard depending on the trim level.